This year's council budgets are the third to be set since Jeremy Corbyn's leadership victory in September 2015. Implementing another round of cuts is not the way to build support for the anti-austerity message which won him that contest and which lay behind the massive surge in support in last year's general election. So what is to be done? The survey asked what were the main outlines of the council Labour Group's proposals for the 2018-19 budget. For those councils with elections it also asked about the local party's manifesto for May and, where Labour's candidates had been selected, whether right-wing Blairites had been replaced. There has been much coverage in the establishment media of an alleged 'lurch to the left' in Labour council selection meetings. This was typified by a Times front-page splash in December claiming that "Corbyn supporters are ousting local councillors" in an "orchestrated purge" across Britain. This particular red scare story was based on the results of re-selection meetings in the London borough of Haringey where supporters of a notorious social cleansing 'redevelopment' scheme have indeed been replaced as candidates for this year's council elections. The "across Britain" evidence cited by The Times, however, was slim - in the one case mentioned in Leeds, for example, involving the Labour group leader, the TUSC survey report shows that she was re-affirmed as a candidate the following day. This was something that didn't make The Times' columns. On the other hand even in the establishment media a different picture sometimes emerges. In December The Guardian's Blairite columnist Martin Kettle wrote that "what is most striking about Labour at the end of 2017 is that, so far, there is little evidence of a systematic attempt to purge the centrists and social democrats" (read Blairites), including for local government candidate selections for May's council elections. So what are the facts? 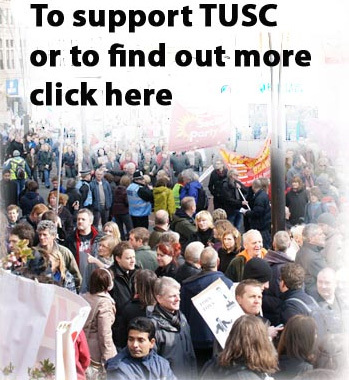 Replies to the TUSC Survey have been received from 34 Labour-controlled councils and, with 124 Labour-led councils in Britain, it cannot claim to present the full picture. But it does show that the Labour right-wing, who oppose Jeremy Corbyn's anti-austerity ideas, are still firmly in control of council Labour Groups and have by and large been re-selected to stand again as candidates in May. The Times is wrong and, on this occasion, the Blairite Guardian journalist is more accurate. The Blairites have not been unseated and are still in place, poised to take positions of public authority for the next four years which they will then use to do everything they can to undermine Jeremy Corbyn and socialist policies. Whether the battle against them must move to the ballot box in May is the question that is now posed. Come to the TUSC conference on February 10th and join the debate!